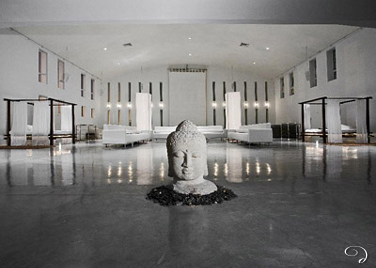 Villa Grandioso is the largest and one of the most spectacular mansions in Miami’s South Beach district. Originally built in 1933, the architect, L. Murray Dixon, designed many of the city’s finest landmarks including the Raleigh, Marlin and Tides Hotels. Grandioso is without doubt an inspiring place to stay. The main lounge boasts 30 foot ceilings and over 6,500 square feet of space. Six, pristine white sofas, two king size day beds, two sets of indoor palm trees and a Jacuzzi, create a room where 50 guests can relax in style. With a 16 speaker state-of-the-art music and lighting system, this is a Bhudda Bar of your very own. Other features include a media room with a large projection screen and full surround-sound equipment and a 1,200 square foot dining kitchen. All five bedrooms are of a size that reflects the scope of this extraordinary villa. Outdoor space is designed in classic Miami sun-deck style and a staff ensure that you at totally at home in this incredible private palace. 4 king-size bedrooms with bathrooms. beaches : 5 min, golf : 10 min, tennis : 1 min.